07 November, 2016: The youth of today live their lives driven by their interests which in turn become an extension of their personalities. They exhibit their passion and their unique personalities, while accessorizing. And they do so with confidence – they are independent, edgy and know exactly who they want to be. 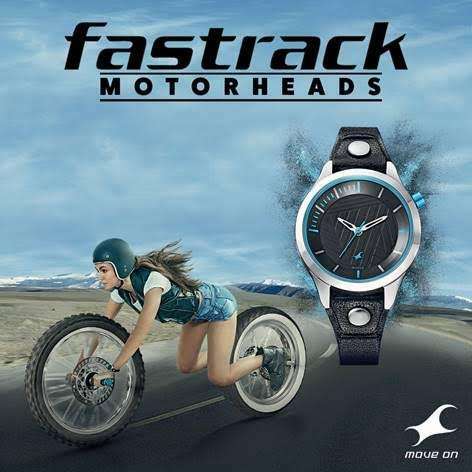 Fastrack’s latest campaign- Motorheads, introduces a collection of watches designed to strike a chord with true blue automobile enthusiasts. A collection that embraces the thrills of riding and revving engines, there’s no mistaking the inspiration behind the Motorheads range of watches. A winding shock absorber holds the crown, the dials resemble twin headlamps, the treads of the wheels form the straps and its spokes the bezel. In true Fastrack style, the campaign hit billboards across the country on 2nd September with bold, eye-catching visuals showcasing the exciting Motorheads collection priced between Rs.1895 to Rs.3995.